Metric - Low Tensile - Sems Assembly are screws or bolts which has either one or two captive washers. The washers are frequently loose on the plain shank of the fastener, the shank diameter being equal to the effective diameter of the thread; the thread being rolled from this diameter. The major diameter of the screw being larger than the washer hole prevents it from coming off. 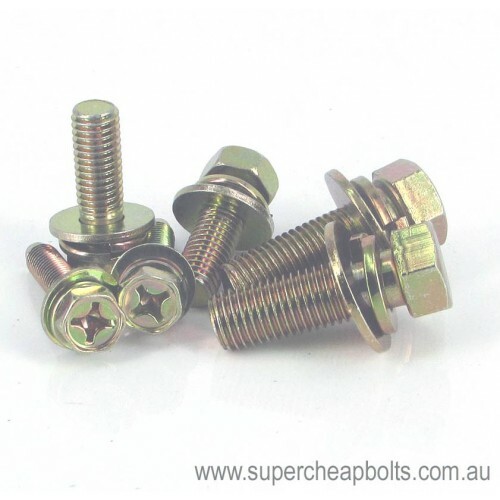 Supacheap Bolts stocks both Hex and Hex Phillips drive with both single or double washers in Zinc Yellow and Black Zinc plated. Supacheap Bolts currently stock M5, M6, M8, M8(1.25)x12mm AF and m10(1.25)x14mm AF diameters Sems up to 35mm in length for certain diameters.